A desperate mum has reportedly been forced to sell her six-year-old daughter so the rest of her children are able to eat. Some starving families in Afghanistan have resorted to selling their own kids in an attempt to survive a crippling drought. Inside a ramshackle camp near the city of Herat, several parents have told reporters they agreed to sell their children, some as young as four, so they can afford food. One mother was filmed by CNN explaining that her young daughter Akila is now owned by an older man in a nearby tent. "I fled my village with my three children because of severe drought," she told the news station. "To avoid starvation among my children, I gave my daughter to a man for about $3,000, but have only got $70 so far. I had no money, no food and no breadwinner - my husband was also killed." 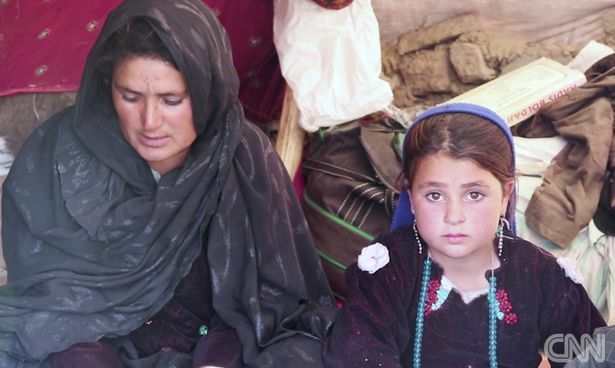 Akila, who sat next to her mother throughout the interview, has no idea what her fate is. Her mother, Mamareen, said the youngster did not know she had been sold. The man who bought Akila, Najmuddin, was reportedly unrepentant when interviewed by CNN. He said the girl's family didn't have anything to eat, and that she would be the bride of his ten year-old son, Sher Agha. Najmuddin also said it did not matter that Akila was so young. "These things happen here. Even an old man marries a young girl. It happens," he said. More than 275,000 people have been forced into temporary camps because of a record dry spell which has resulted in a desperate lack of food in the region. Najmuddin said his own wheat and melon crop failed and all his sheep, cows and goats died because there was nothing to feed them. And he was not the only person in the camp who admitted to buying and selling children to get by. Another father who refused to give his name told CNN he had sold his daughter, who was just four, to settle a debt. The drought is so bad that the UN has estimated it has displaced more people than the ongoing war between the Taliban and the government. In the 20 provinces hardest hit by the crisis two million people will become "severely food insecure", the organisation has said.